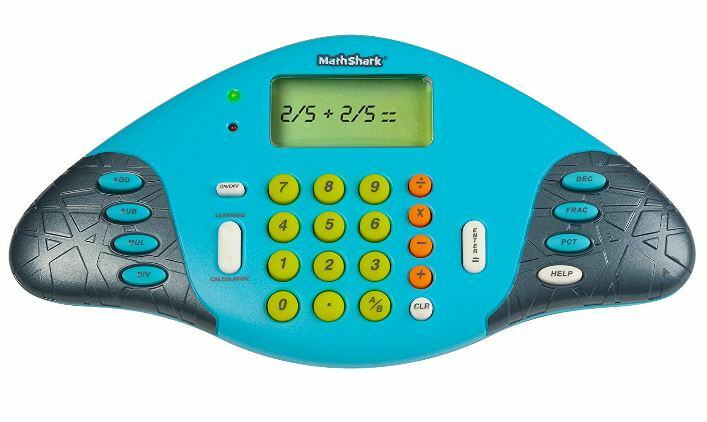 Kids love learning Math games on the Math Shark from Educational Insights. It's a nifty little math calculator that works like a toy. Kids "playing" math which makes math drills fun. It teaches the times tables, one through twelve to automaticity. Children love these kinds of toys. Even big sister liked seeing if she can beat her own scores. Of course, it's a lot more fun when you've got two Math Sharks and you can get faster than your buddy. The colors alone make these look like fun toys for kids. Math facts practice builds basic Math facts skills fast with electronic Math flashcards PLUS a Math calculator! 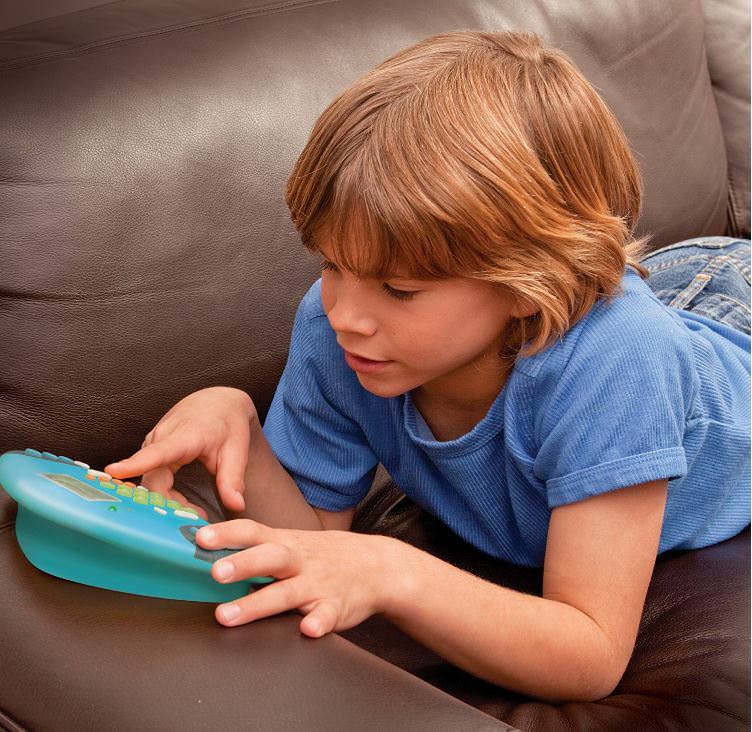 Practice math facts anywhere with this fun handheld Math game for kids. Quizzes students on addition, subtraction, multiplication, division, fractions, decimals and percents, either randomly or sequentially. Kids love when math is taught sequentially first. It makes more sense. Features 8 skill levels in each category to keep students challenged. Requires 2 AA batteries, not included so be sure to get batteries. 1st grade math through 6th grade math games. Easy math games make learning addition fun. Second grade is when most children should know their addition facts. Addition is "fast counting", yet when kids can learn the addition facts in a game, they learn with less effort. For one thing it's fun. Subtraction, too. Subtraction is the inverse of addition, so it's important to teach them together. The one depends on the other, back and forth. Addition games teach the addition facts. Subtraction games teach the subtraction facts. The Math Shark has fun math multiplication games for third grade. Multiplication games teach multiplication math facts. The division games teach division facts. It also covers Math Fractions, Decimals, and Percents.This electronic Math game is great for 1st grade Math through 6th grade Math students. It is entertaining and when given the right encouragement, environment, and disposition it will teach real skills for the basic Math facts. There are progressive levels to sharpen mental Math skills from basic Math facts to pre-algebra practice. It makes a fun introduction to using a full function Math calculator for kids who will be using calculators in school. It is battery operated for true portability. 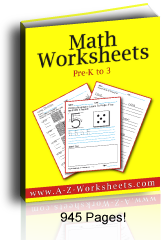 Do you have kids learning Math games? Teach them to play against the clock to see how fast they can go. Students work at their own speed with a timed, no-fail game format with all the bells and whistles to keep track and to compare with their own scores. When kids focus on getting fast with their math facts, the games are easier and they learn faster. The help key offers clues to solve equations. Screen displays equations vertically and horizontally. The button switches to Math calculator. Having a Math game makes learning Math fun, and it's a great way for teachers to sneak in more practice. Buy a Math Shark at Amazon. Kids love the Math Shark. It looks like a toy!